In our giant strides towards creating confidence in all and specially treating each human as "celebrity", we visited a lot of posts round steemit and gave them our tinnie-winnie upvotes, to strengthen and encourage them. It is our 'utmostest' desire that all would see themselves as geniuses as we have been able to 'sift' sense out of nonsense.We curated posts which met the criteria of 'untalented'. They were all the awesomest versions of "untalented" humans, heartfeltly humans who had something to offer.#untalented abolishes the connected IQ tests eg smart, dull, bum and suddenly gives every human the chance to shine! Now, I am not saying standards or human standards are wrong. All I am saying is: You can do it, so do not let these standards prevent you from starting out-of-the-boxness altogether. Finding out, who you truly are or attaining the awesomemest version of yourself, is essential to greatness and is a gift to humanity, every time! Thus, #untalented is a home for all forms of levels of talent. With #untalented flaws are allowed. There is sense in nonsense. All winners! No loosers! @normalguy's welcome me the normal guy in the community! @kennethjames'my undying love for annie pt 1 short novel series! @euronation's to make a great social life these are the most important skills you should have! @dyanna's food 4 of the series of 30 healthy foods to loose weight! @smyle's what is golden about golden rule! @mrtaleb's 10 benefits of red roses for facial health and beauty! @leeyen23's dream believe survive or be positive in life! @harlot's had time to play basketball with my friends a moment that will last for a long time! @rezalhok's looking for a rare flower of its preservation! @jerometrically's breakfast at charito by bag of beans! @josephfugata's why the news about paypal is nonsense and not even news! @juviemaycaluma's selfie photo editor make your photos memorably amazing! @reyarobo's the 14th steemians basketball meet-up corinthians subdivision basketball court basak lapu lapu city! @ailenepm's the contest of petals pinkflowerday! @mahayahayyouth's kakanin filipino food delicacies! @ayahlicious' stroll around the mother of all parks in cordillera burnham park! @mariejoyacajes, fish adobo for our dinner! @jumargachomiano's dashbon mask a movie theatre in your headphones! @hery1983's flowers that bud during the day and bloom at night! @rezalhok's the enjoy the natural beauty at dusk! @beyonddisability's otter voice makes texts out of your recordings! @gemstones' helps improve the immune system immunity of the body! @fherdz's making something beautiful out of broken pieces! @yennarido's live life to the fullest and keep our face to the sunshine! @missteriously's facts about sweet potatoes! @shula14's update for my steem Power goal! @mira15's smartphone photography a flower blossoms for its own joy! @hagi's what makes you beautiful! @elvinjohn21's pork dinuguan or pork stew! @msswaggerfuck's take a pause sometime! @reyarobo's steemians basketball meet-up villas magal! @steemitoni22's the true beauty of nature! @nickjon's the taste of true natural goodness! @lydamaxine's from mahalo with love! @benotbuday's coconut as my source of income! @mcamayra's dream come true for a teenage girl! @ugetfunded's june 30 days writing challenge life hack keep a list of music albums! @andyjem's famara from the cliff top! @missteriously's up 03 commitment over falling! @aoife's you'll never know when will be the last time! untalented is a branch of the #steemgigscommunity. Join the steemgigs community on discordhttps://discord.gg/CGuPyyT. If you would like to offer your service in building the dreams of other steemians, you can do so under #steemgigs .However, if you want to experience full blown freedom and grow in confidence about your gifts and talents, share under #untalented .We aim to create historical moments in the genre of touching lives and you can support us if desired, by voting on steemgigs for witness. Simply click here https://steemit.com/~witnessesand type steemgigs in the first search box. 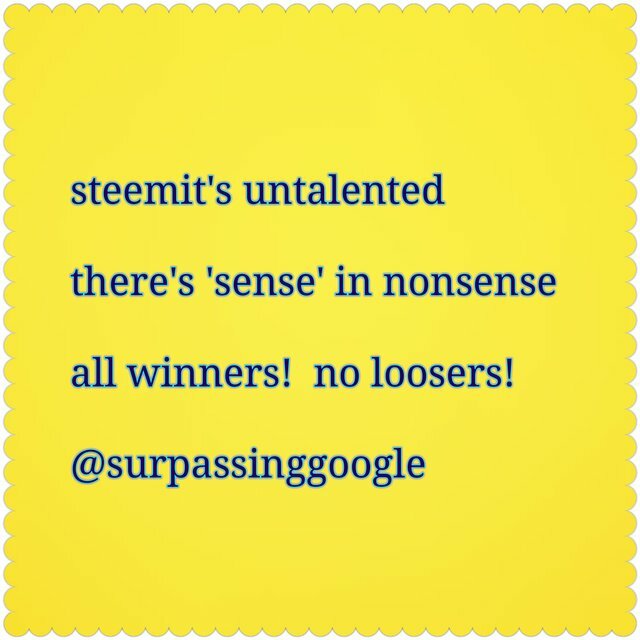 https://steemit.com/steemit/@surpassinggoogle/steemit-s-untalented-is-in-beta-participate-freely-because-every-participant-in-this-contest-will-win-something-no-losers Just incase you find any level or form of gifts, talents, attempts at out-of-the-boxness, or any steem in confidence about their abilities, worth, etc; please do not let it slip emptily by.Kindly call on me! Simply reply to any such post and add @ steem-untalented or #untalented to your reply and i will be there to upvote, acknowledge, strengthen and encourage them. un(dis)talented is just one of the many Steemit Projects by @surpassinggoogle in celebrating the Human. Congratulations to my fellow Steemians featured in this batch. I would like to thank @surpassinggoogle for curating many Steemians. Wow! I'm grateful to read my sister's name here @shula14 curated by steem-untalented and Sir Terry. Congrats bes. Warm congratulations. You have introduced some great steemit members. Thanks for sharing. Congratulations @shula14! And to all who got featured today. Have a good day! Congratulations to all featued! Most especially to @shula14 for your steem power goal! I am inspired to have the same goal. Congratulations to all steemians who's curated here. Hope you're feeling a lot better now Big Bro.? Wishing you a quick recovery. Congratulations to all those featured. Keep being amazing and Un(Dis)Talented. Keep attempting out of the boxness and never give up. Congratulations to everyone who has a list.